SXSW is almost over — well, it technically ends on Sunday, but that’s pretty much only good for catching your flight back home or, if you’re brave enough to soldier on another day, sticking around to play softball and eat barbecue with legions of SXSW volunteers. Or maybe you didn’t go this year, like us, due to other obligations. 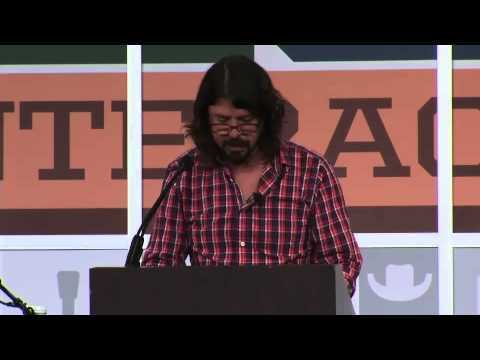 Regardless of where you were this week, if you haven’t seen it yet, you owe it to yourself to catch Dave Grohl’s SXSW speech from yesterday, which runs the gamut from his childhood recordings to older cousin Tracy the punk rocker, his joining Nirvana, the release of Nevermind back when seemingly everyone actually bought music, the futility of Pitchfork’s assigning of numbers to songs, his sincere love for “Gangnam Style” (he’d like this version even more), and why we never need to feel guilty for liking something. Death to “guilty” pleasures! Yes, Grohl is “from the past,” at least a little bit, with his love of analog recording gear (see his Sound City documentary), his memories of hit albums selling 300,000 copies per week, and his obsession with Beatles vinyl. But there’s always something zeitgeist-y about the SXSW keynote, and this year was no exception.